August 2012 - Deb Arnold, Ink. I often find pearls of wisdom in the expositions of copyblogger. It’s an incredible resource for anyone who blogs or markets in general (which, when you think about it, is really everyone: we are always selling something to someone, e.g. “How about we go to that new Indian restaurant tonight? I hear it’s fantastic. It got great reviews on Yelp.”). NO ONE CARE ABOUT YOUR STUPID THING. WHY? YOU HAVE WRONG BECAUSE. BECAUSE WANT. BECAUSE GREED. BECAUSE SELF. WRONG BECAUSE ALWAYS MAKE FAIL. HAVE RIGHT BECAUSE INSTEAD. ME, FAKEGRIMLOCK, TELL YOU HOW. Now, I love grammar as much as the next word geek, but this guy really makes his point. I do encourage you to read the whole thing. Give people the truth, care about them (vs. yourself) and help them to be better – this will bring more good into the world. Kind of hard to argue with. The post resonated for me because it speaks an important truth. What gives me satisfaction is knowing that I have helped my clients to succeed, in whatever way, on whatever level. And if that motivation is missing, it will show. I especially love helping my clients win awards, because the positivity simply radiates outward. The leader is thrilled, the team is thrilled and company leadership is thrilled. The win can then be leveraged to attract customers, talent, suppliers. It’s all good. This week I am introducing my first “information product,” a set of resources to help folks applying for the Training Top 125, a global ranking that involves a particularly long and tricky application. I have helped clients improve their ranking on this award four years in a row, and I have seen the confusion and frustration that comes with tackling the lengthy application. I can help make it easier by supplying insights and tips on how to answer questions, which aren’t always as straightforward as they seem, and sometimes they don’t seem very straightforward at all. This helps people be better: better at presenting their accomplishments, better at accurately reporting their activity and better at highlighting significant achievements. The bottom line: more hard-working professionals, and their companies, will get the credit in recognition they deserve. As those of you who have seen my 2011 holiday video know, I am a big fan of Julia Child. Apparently, so is much of the rest of the world. It has been a delight to see the attention showered on this brilliant woman, chef, writer, entertainer and entrepreneur on the 100th anniversary of her birth. In particular, I love this video montage produced by WGBH in Boston and of course the Google Doodle pictured here. If you’re even vaguely interested in learning more about Julia Child, I do recommend her autobiography, My Life in France, written by Child and her husband’s grandnephew. She had a truly remarkable life, which you can focus on exclusively, as opposed to watching the movie, “Julie and Julia,” which forces you to split your attention between Julia and, well, someone else. 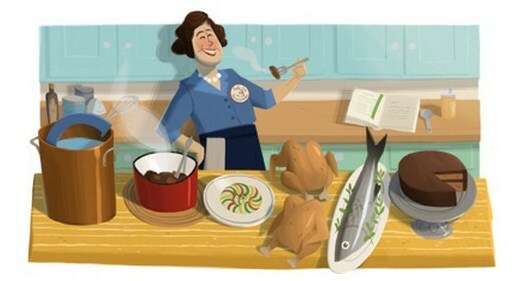 So what does Julia Child have to teach us about communication? – First, I think she and I have essentially the same motto: know your audience. She understood that to write a French cookbook for American housewives, she would have to account for differences in cultures, weights and measures, kitchen equipment, availability of ingredients and the like. It wouldn’t be enough to simply translate recipes, as her collaborators might have thought. – Second, Julia also understood that to be embraced, you must be genuine. Her zest for life and passion for the culinary arts were always apparent, and her penchant for goofiness made her all the more authentic, and endearing. – Third, you must truly make a difference. Why communicate at all? To enlighten, educate, entertain, to inform, instruct, inculcate. The people to whom you are communicating are infinitely more likely to respond if they believe that you are writing in order to help them in some fashion, that you care and want to make a positive impact. It has always been clear to me that Julia Child deeply wanted to enrich the lives of her readers and TV audiences with new skills, perspectives and experiences. And with that I say, bon appétit! The HBR Blog Network has come through again with an insightful article, Ten Reasons Winners Keep Winning, Aside from Skill. To grasp the secrets to sustainable success, she compared consistent winners and losers in sports, then compared her findings to case studies from the business world. I would posit that the same ten advantages apply to companies that win awards. “1. Good mood. Clearly everyone feels good about winning, while emotions sag at failure. 3. Learning. Losers get defensive and don’t want to hear about their many failings, so they avoid feedback. Winners are more likely to voluntarily discuss mistakes and accept negative feedback, because they are comfortable that they can win. 5. Positive culture of mutual respect. For anyone who plays on a team, winning makes it easier to respect and listen to one another, because after all, if you win together, then the presumption is that everyone is a good player. Do you feel you are consistently winning at whatever you do? If not, what can you do about it?